Sweden's Sven Holmberg is to challenge Princess Haya for the presidency of the International Equestrian Federation (FEI). The Swedish Equestrian Federation announced on Thursday it had nominated Holmberg, who is currently first vice-president of the FEI, a position he has held since 2006. The election will be held in November when the 130 member-nations of the Switzerland-based organisation gather in Chinese Taipei for its annual General Assembly. Holmberg said he was honoured by the nomination and the support for it, which extended beyond Sweden. Holmberg has been active in the equestrian world, both as a judge and tournament organiser at international competitions, and has held elected office, in Sweden and internationally, for many years. "I have gained a great experience and now have several things on the agenda I want to change and improve in the International Equestrian Federation's work," he said. "Equestrianism needs to unite around common values, where the horse's welfare is central." He called for greater co-operation between countries, working towards an improved understanding of how the world looks at equestrian sport. "There is a tendency toward a crisis of confidence between different parts of the equestrian world and I want to keep riding together so we can share each other's experiences, share our knowledge and get a well-functioning international organisation." Holmberg has been an outspoken critic of controversial moves at the FEI General Assembly in Copenhagen last year to move toward a so-called progressive list of drugs that would allow low levels of common anti-inflammatory drugs in competition horses. "It's really quite impossible for me to go down that road," he said. That debate, he said, was a determining factor in making the decision to stand as a candidate for president. 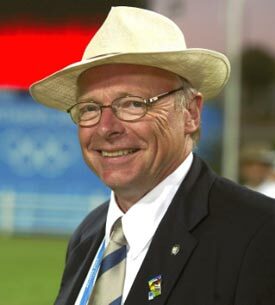 Swedish Equestrian Federation president Bo Helander said: "Sven Holmberg enjoys the confidence of the equestrian world and, with his experience from boardrooms to arenas, would be an outstanding president of the FEI."